British writer/director John Williams is back with this vampire comedy horror. When 2 men (Nigel and Job) at a cult meeting (the B.S.C.C. Big Scary Comet Cult) decide not to drink the poison which will see them leave this mortal coil and end up with God they go on a personal quest to do everything they can before the supposed comet their cult leader was telling them about hits Earth and kills everyone. But as luck would have it life is never simple and they must contend with a horde of vampires. Together with their new found friend and fellow vampire slayer Reg they seek to rid the world (or at least Scotland) of this vampire plague once and for all. This is a well rounded comedy horror that sees the return to form of vampires as we know them, no sparkly 'TWILIGHT' rubbish here. 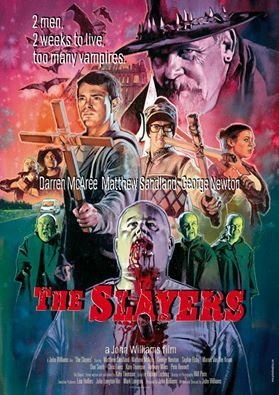 Great acting from everyone involved especially George Newton as the vampire slayer Reg. If you have seen 'THE MOTHERTOWN', John Williams first feature length film you will be able to see how much he has come along as a director with 'THE SLAYERS'. This is sure to be a festival hit and a cult classic in the making.